Béla Fleck performing on February 9, 2007. 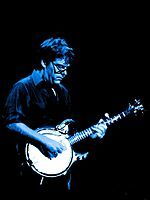 Béla Fleck (born July 10, 1958 in New York City, New York) is an American banjo player. He is best known for his work with the band Béla Fleck and the Flecktones. Béla Fleck Facts for Kids. Kiddle Encyclopedia.